The second modern U.S. Armour model I built was the M2 Bradley I.F.V. with full interior. 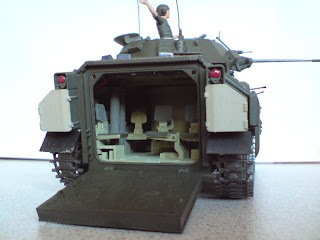 I really like building models with full interiors, not only does it provide a prolonged model making experience, it also opens up all sorts of display/diorama opportunities. This one is quite an old model and is starting to show signs of wear and tear from being handled by so many people wanting to peer inside! So, my next project is to repaint it and, using some spares that I still have, re-apply the decals. I will be starting this process after I finish this post and when I have complete the repaint, I will upload some pictures of it. My M2 Bradley I.F.V. showing signs of wear and tear.